This will be the only post today, because this morning I found 2048 and have wasted an inordinate amount of time studying/playing it. 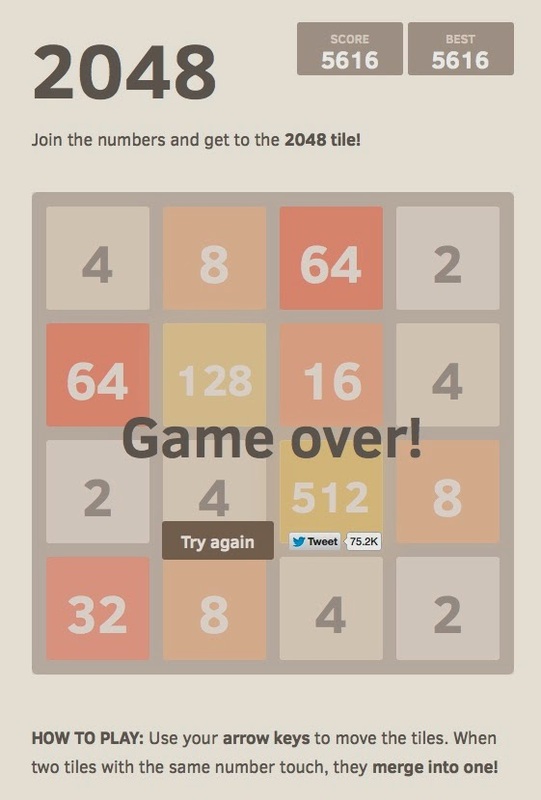 As noted by the embed above, so far my highest score is 3408. (After another hour, 5616). After another day 16,176. I have to get some work done this weekend and can't afford to waste any more time. But I don't mind wasting your time. Have a go, and feel free to post your best score (and strategy tips) in the comments. The embedded image is just a screencap. THE GAME IS HERE.
? ?is there a way to predict in which empty square the new tile will appear? - and maxed out at 33,800. Finally I can quit and go do something productive. Starting at the second 2 of the top row (or, in practice, at the top 16), one can then sweep all the way down in a sinuous curve to convert the 1024 into a 2048. This kind of configuration is not necessary to generate a 2048, but it certainly is esthetically pleasing. 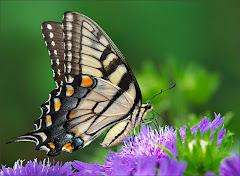 ... which I finally saw on my way to a final score of 50,936. I'm done with this game. Time to move on. Update 4: A tip of the hat to reader Matthew for sending me the link to this article about the strategies used by artificial intelligence to solve the puzzle. "Most instances ended with a score around 390,000 and a 16,384 tile, but the best instance built a 32,768 tile and stayed alive long enough to reach a score of 839,732." and then (wisely, I think) opted NOT to "keep going." 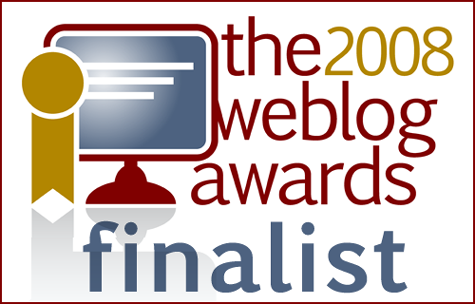 Jan reported that she had "been beavering away for several months, have a score of 128,386,728! Have 2 tiles with face value of 2,097152 which would give me the magic 4,194304 tile but they are not near each other :( "
The game is here (and other variants from the pull-down menu). Discretion advised. Nice find, MinnesotaStan! I've cancelled all my appointments today. Thanks! Took me a week of playing but I beat it. High score of 20552. You're headed in the right direction. You want to try keep that left row full and in order at all times so it doesn't move. And don't build it out that far to the right. You're costing yourself valuable space. Thank you guys. Using your suggestions I've now reached 7500. Not sure I'm crazy enough to keep playing to 20K - but maybe it increases more logarithmically as the higher tiles accumulate. Very interesting. Is there a theoretical maximum? The game "Threes" for iOS devices is very similar and I enjoy it, might be worth checking out. I'm downloading this one and am looking forward to how they are different. 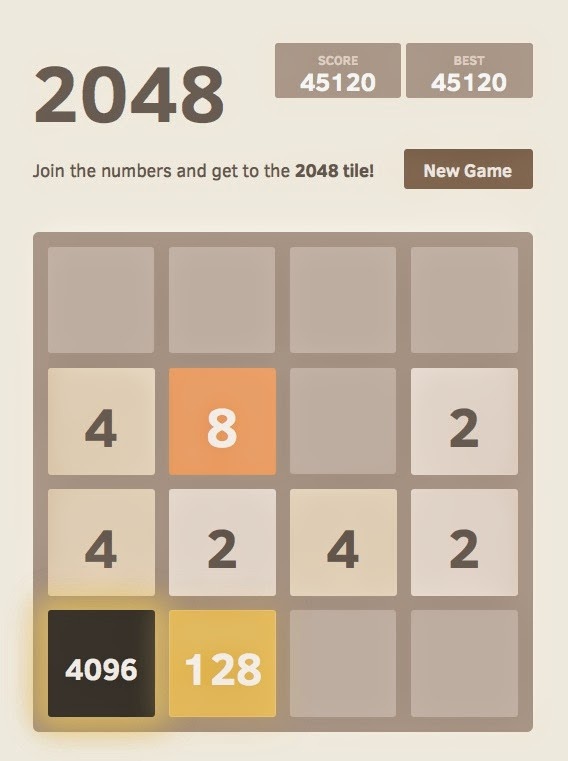 Ah, 2048 swipes all the way across the row while threes moves one square at a time. Interesting! If you will look at the bottom of the page, you will see that the author gives a nod to Threes. When my editor asks next month where is my manuscript, I blame you, sir! I beat the game after a couple of days, with a score of 21244, using more or less the same heuristics which bucaneer outlined above. What's more interesting about this game is how massively viral it has gone in the last week, spawning dozens of clever or silly variants. My friend collected some of them into a facebook post, which I appropriated: http://pastebin.com/q9gEuMT0 (the list is certainly out of date and incomplete now, as it is at least three days old). This game was invented by the National Carpal Tunnel Surgical Association, right? My best so far is 52272 (after clicking "keep going") using the same main strategy as Bucaneer's comment. If you want to feel bad about your score, have a look at the reddit thread on the game. Apparently a 32k block is theoretically possible to achieve. haha how do you pronounce doge? Ahhhhhhhh! Why did you have to show me this? Got 4,404 on first try, and 12,580 on second try. But now I really want to get to 20,000. I've got so much to do today! I managed to get up to 79712 after investing a week's worth of before-work time. 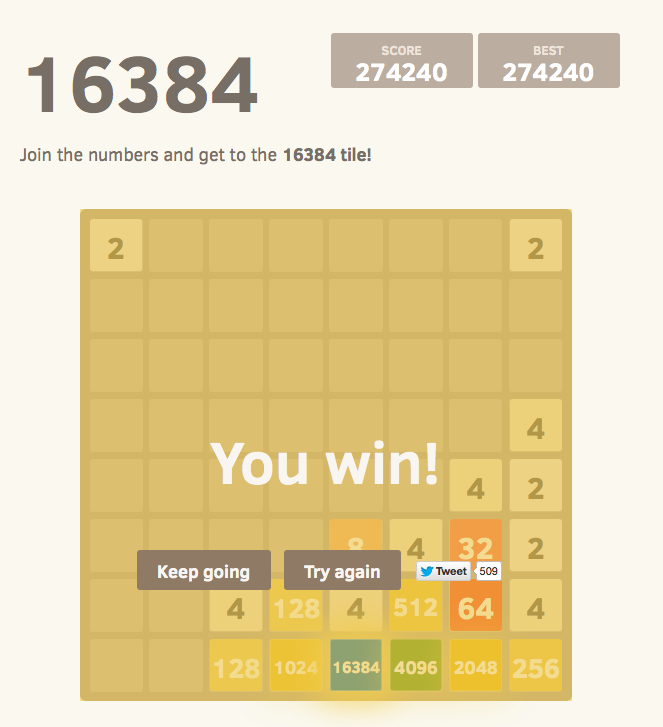 That got me up to a 4096 tile, a 2048 tile, a 1024 tile, and then some random cruft. The key to getting a really high score was twofold: first, work really hard to only have one of every tile value above the "working values" of 2, 4, 8, and 16. Second, avoid creating situations where it's necessary to move the "highest tile" out of the corner that it's in. This is partly due to luck, but it's also a matter of sometimes purposefully not combining a tile into a lower row so that it's still able to move. I will now try to forget that this game ever existed, but thanks for the link! Two quick questions before you go and cleanse your mind. Did you see a pattern or predictability as to which square each new "2" would appear in? Occasionally I see "4" appearing as the new tile instead of a "2." Is that a random event? and this is a good lesson on why i should not try crack. i was able to get the 2048 and some beyond by making use of a bilateral strategy, running the big tiles in the top middle and working everything else from the sides up and in. i had no luck working toward a corner. 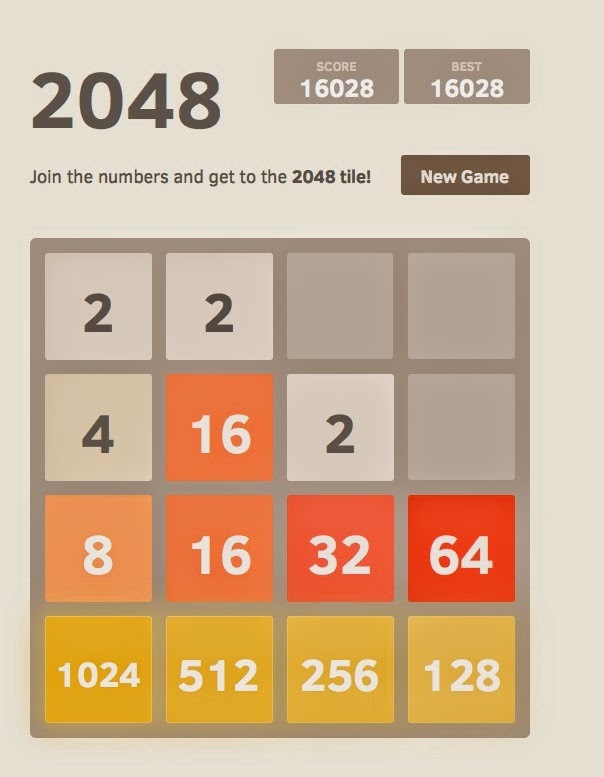 after 4 days and countless hours, and a new syndrome called "2048 Wrist", finally made it made to 2048 and 27,000 points. i worked to the top left corner, and did everthing I could to keep from having to move out of that corner. 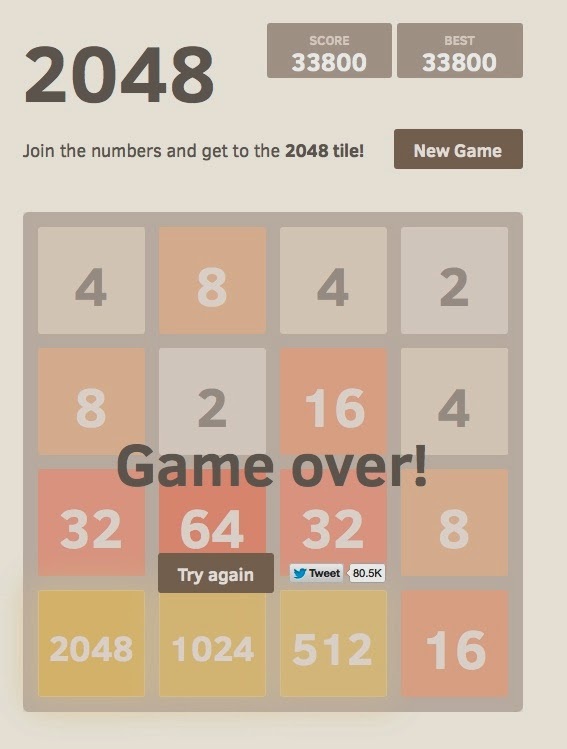 interesting though, at the end of the game my 2048 was in the LOWER left corner. haha! I thought I had lost my phone, but it was only temporarily misplaced. First thought was horror at loss of info, second thought was buying a new phone and being cured of the addiction so I continue on, pretty sure I read about the Super version on here, thank you? Thank you for the note Jan. I've updated the post. Dang! I got it on the first try. Total points lower than yours, Stan, but happy with 204,512. Was actually getting bored with it but stuck it out. Seems the AI has confirmed much of the above comments/ play styles! I had not seen that. I've moved the link up to the body of the post. Thank you, Matthew, for the heads-up.